PUEBLA, Pue. (appro) .- At least five people riddled in an armed confrontation were located this morning at kilometer 224 of the Puebla-Orizaba highway. 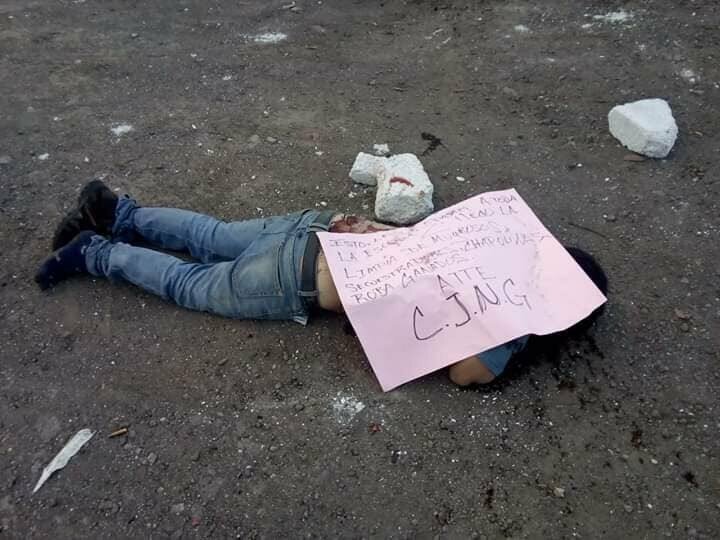 In the place were left cardboard with narcomensajes signed by the Cartel Jalisco Nueva Generación (CJNG). 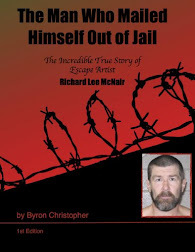 According to the police reports, along with the bodies there were long weapons and a vehicle with traces of gunfire, so it is presumed that an armed confrontation was recorded or that the executed subjects were ambushed by a rival group. 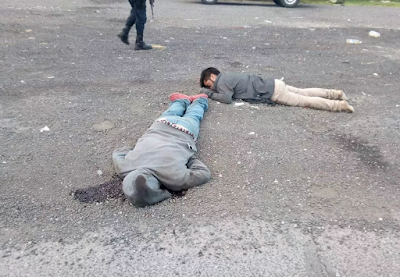 The State Police received the report this morning that there were people wounded by bullets on the side of the asphalt strip at the height of the municipality of Esperanza, Puebla, on the border between Veracruz and this entity. Upon arriving at the site, in addition to the slaughtered bodies, they found a black Nissan double cab, with license plates NW97869, which was crossed on the road with crash signs and traces of gunfire. 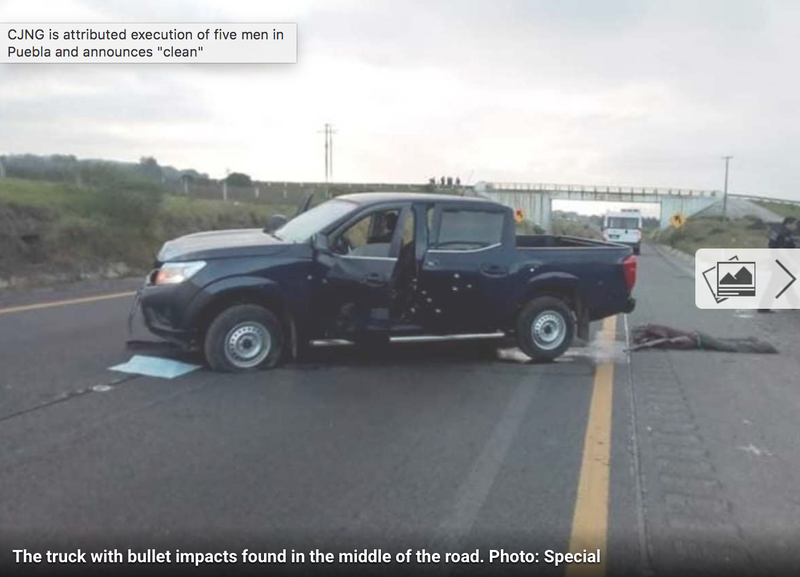 According to unofficial reports, a tractor-trailer that was allegedly assaulted was located a few kilometers away, so it is presumed that the bullet-riddled group could be related to this crime. The narco manta left on one of the men riddled with bullets. "This happens to all the scum Z, we came to clean the filthy, kidnappers, grasshoppers, cattle robbers," said one of the cards. So far the authorities of Puebla have not issued official information on these facts. The traffic on the Puebla-Orizaba highway is stopped due to the diligences on the part of authorities for the removal of the bodies which were strewn along the edge of the roadway. 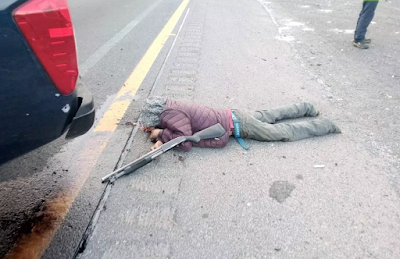 Inhabitants of the municipality of Esperanza reported that during the early morning a shootout was reported in the vicinity, a fact that is related to the finding on the highway. In his appearance yesterday in the State Congress, the Secretary General of Government, Diódoro Carrasco, said that the Jalisco Cartel Nueva Generación tried to enter the entity and control criminal activities. 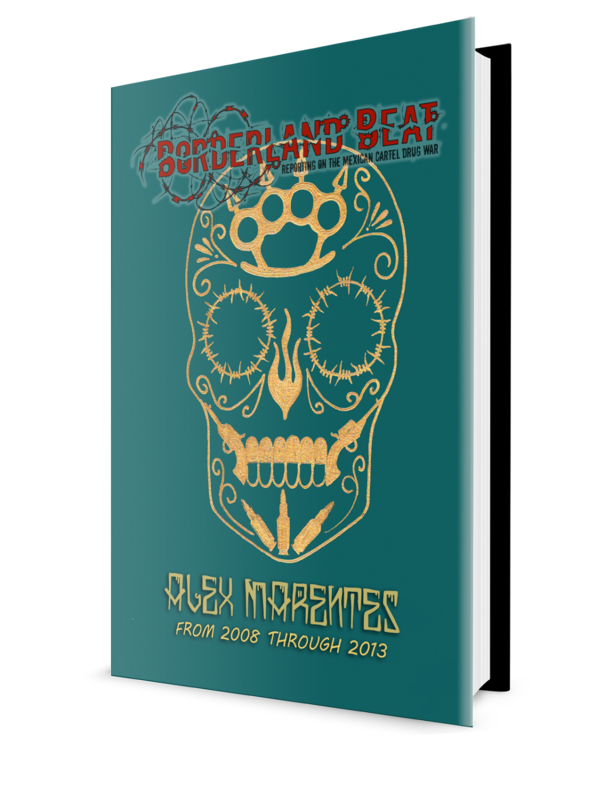 However, he ruled out that they are settled and in operations within the territory of Puebla. Until 8:30 hours at kilometer 221 of the Puebla-Orizaba highway, maneuvers were still being carried out as part of the investigation into these events. It is estimated that the actions would continue for at least three more hours. Roads and Federal Bridges reported the closure of the road to warn users to take alternate routes. CJNG stated "we come to clean kidnappers, grasshoppers, cattle robbers", what a hippocrite manta...they themselves are killing innocent people, extorting, kidnapping, what a disgrace to Mexico. 3:37 yet another dummie saying they trying to bring the heat on cjng using their name..
And who will clean up the SCUM of these particular individuals? Funny how these groups claim to be the savior of society. Yet the extortion,kidnapping and murder continues under their regime. Yeah. "We will come to your town riding rainbow colored unicorns! We will turn all your frowns upside down!" That's more believable. Such bs! Good luck, Puebla has been Z country for a decade now. who controls Puebla? CDN or ZVE?